Founded in 1898, French automotive manufacturer Renault operates in 128 countries with a range of nearly 30 vehicles. One of the critical areas of innovation for Renault is its initiatives to promote road safety for customers and communities around the world. One of Renault’s key corporate social responsibility (CSR) objectives is to contribute to public health objectives by bringing down the fatality rate on the roads, especially in developing countries. The company has made a commitment to consumers and public authorities to promote safe driving and stringent safety standards in the production of their vehicles. 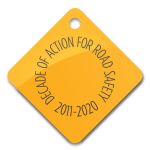 Renault has a range of road safety initiatives to achieve their commitment to safer road use. The company has provided road safety education to more than 15 million young people in 15 countries – the largest worldwide road safety awareness programme ever carried out by a carmaker. Renault has also opened a dedicated safe and responsible driving training centre, open to individuals and companies, including access for people with reduced mobility. Safety is an integral part of mobility. As a carmaker, our aim is to make the road a safer place. That’s why we commit with motorists and public authorities to promoting safe driving and why we respect the most stringent safety standards in the production of our vehicles. However, human error is behind more than 80% of road accidents. That’s why Renault is also involved in awareness-raising activities for all audiences in all the countries where it operates.